This NEC Digital Quick-Start Kit with 24-Button Telephones offers everything you need to manage the day-to-day operations of your small business. The main SL1100 Key Service Unit (1100010) has 8 Digital and 4 Analog line ports with expansion capabilities. It also features an ethernet port, 4 mobile extension ports, and 32 conference channel resources. Also included is the 4-Port CO Trunk Daughter Board (1100022), which supplies four loop-start CO trunks for your SL1100 PBX phone system. It has 4 feature keys and navigation keys with programmable LED keys. This Daughter Board also includes power failure transfer circuit for one line. The 2-Port InMail CompactFlash (1100112) is a Voicemail Card that adds 84 Subscriber Mailboxes, 16 Routing Mailboxes, and 16 Group Mailboxes. Auto Attendant and other voicemail functions are included features as well. The Digital 24-Button telephones (1100063) come equipped with 9 fixed feature keys, energy saving sleep mode, built-in wall mounting, and innovative two position angle adjustment. The NEC SL1100 Package (14 Digital Phones) has many exciting features for users of all types. 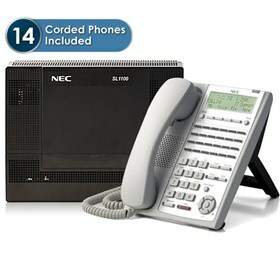 The NEC SL1100 Package (14 Digital Phones) is sold as a Brand New Unopened Item.